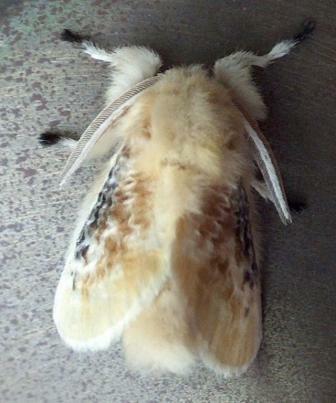 Identification: Adults are moths ( Flannel moth)that lay eggs that hatch into a dangerous larva. They are worms with pretty hairdos but will sting severely. 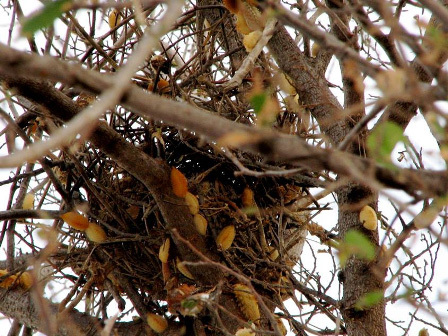 The sting comes from hollow spines hidden by the soft fur in several colors ranging from blond to dark brown. Biology and life cycle: One generation per year. Winter passed in cocoons attached to twigs. The moth emerges from an over-wintering cocoon in late spring or late summer to deposit its eggs on trees and shrubs. 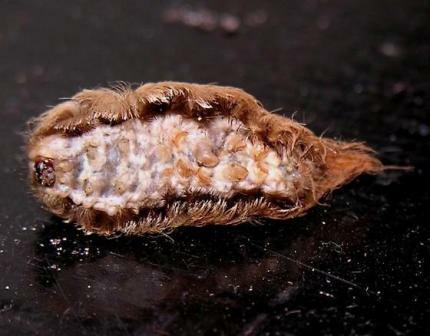 In a few days the eggs hatch into tiny, fuzzy, whitish larvae that look like small tufts of cotton. 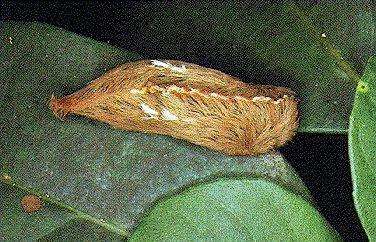 Puss caterpillars become darker as they mature. Complete metamorphosis. Habitat: Oaks and other tree trunks primarily. 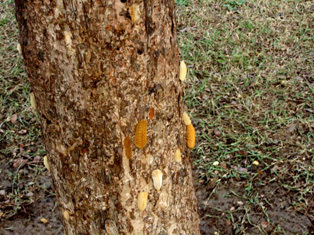 Feeding Habits: Larvae feed mainly on deciduous trees and shrubs. They usually don't do a lot of damage. Economic Importance: Dangerous stings, especially for youngsters. Natural Control: Predatory flies and wasps. Release of trichogramma wasps should help to control these pretty but dangerous insects. Organic Control: Bacillus thuringiensis, or plant oil products. Insight: Contact on tender skin is extremely painful. Put scotch tape over the sting and then remove it to pull out the irritating spines; then wash the area well to remove any remaining poison. Juice from the stems of comfrey plants may help relieve the pain. There is no really good home first-aid for the stings, so the best thing to do is consult a physician. Sensitive people may become very ill. The asp is easy to identify, despite their different colors. Some may be brunettes, some are gray, most that I have seen are blondes. My mother reached around a post to unlatch a gate and accidentally rubbed the inside of her wrist on one; it put her in bed for two days. This moth is not very prolific. For protection, nature gave them hair that secretes poison. This helps ensure the survival of their species. Usually, there are never enough asps to warrant insecticidal control, but if necessary use Bt. I consider the asp the biggest enemy to the praying mantis, not because it attacks the mantis in any way but because ignorant humans often mistake the mantis egg case for that of the poisonous asp and mistakenly destroy every mantis egg case they come across. 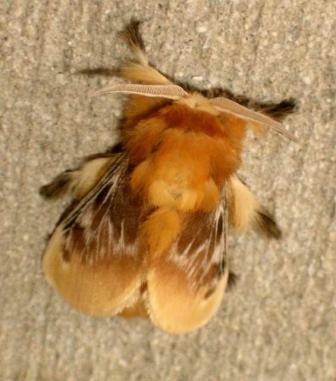 Adults are moths (flannel moth) that lay eggs that hatch into a dangerous larva. They are worms with pretty hairdos but will sting severely. The sting comes from hollow spines hidden by the soft fur in several colors ranging from blond to dark brown. Organic Forums: Asp Caterpillar cute and fuzzy but not friendly.